Texas wine industry and marc, by-product from grape crushing. 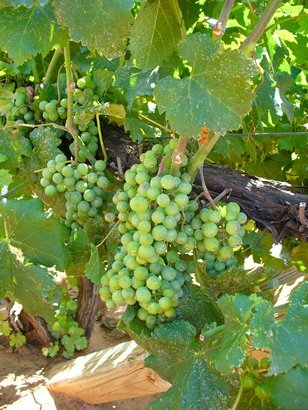 The wine industry in Texas is blooming. 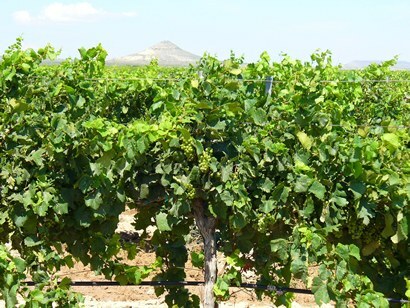 The Texas Agriculture Department lists almost 180 wineries in the state and reports that as of 2007, Texas is this country’s 5th largest producer of grapes and wine. For anyone who has traveled to West Texas or the Hill Country during the past several years they have undoubtedly noticed the many rectangular, maroon Winery signs along the highways, a number that appears to increase with each new season. The viticulture industry in Texas is certainly growing to Texas-sized standards. For example, the Ste. Genevieve winery, near Ft. Stockton, Texas, the state’s largest producer of wine, exports an average of 1.6 million gallons of wine annually. Even by Texas standards the figure is staggering. When considering the size and production of all of the other wineries around the state, operations as prolific and fecund as Pheasant Ridge, Llano Estacado, Becker Vineyards to name only a few, it should be clear that we are witnessing the rapid growth of a unique industry. Where once cotton, soybeans, onions and melons dominated the fields of West Texas, now thousands of acres of grapevines hang lazing in the afternoon’s sun and snoozing in the cool, dry desert evenings. The production of anything though will leave a trail of by-product. (Just watch my son, home on loan from Austin College, as he makes lunch for himself in our kitchen.) Corking thousands of additional bottles each year requires the harvesting and crushing of ever more tons of grapes. Spurred by demand and enthusiasm, most wineries are increasing production with each new season, planting hundreds of additional acres to try and keep up with the market. The creation of all of this wine however is creating a problem. The grape stems, stalks, skins and pulp that are harvested every year are producing piles (literally tons) of detritus that no one, it seems, knows how to cope with. Trampled under foot is not only the title of a Led Zeppelin song, it is also the definition of the French verb marchier, from which we get the word marc-the term for the by-product from grape crushing. Given that 100 kilograms of grapevine produces 20-25 kilograms of marc, what can be done with such an enormous amount of this waste? I asked Bill Gipson, the owner of the Pheasant Ridge winery outside of Lubbock what his group does with all of the marc from their productions. His response illustrated the prevailing sentiment. “I really don’t know, “ he stated and then directed me to ask Manuel Lechuga, the winery’s manager. Later, I asked Michel Duforat, the general manager of the Ste. Genevieve winery the same question. Duforat stated that their winery gives as much as possible to local sportsmen for deer feed, adding that, “the wild turkeys and dove love it!” However, Duforat is referring only to white marc or, that debris that is the residue from white grapes. The red contains alcohol since the pomace (the resulting product after grape crushing consisting of the pulp, skins, etc.) is produced only after fermentation. Whatever is not used as deer feed, the winery distributes as fertilizer among the vineyard, a process employed by just about everyone. Recently, I read that there is a company in the Mid-West that is collecting marc and pomace from area wineries and, after drying the stuff out, is pressing it into pellets to be used as a heating source. American ingenuity as its finest. (If only it could be liquefied and used in our cars!). Traditionally, marc and pomace have been pressed a second time and used in making all of those brandies and liqueurs that the wine-producing countries of the world are so famous for, e.g. Grappa in Italy, Ouzo in Greece. However, in this country, where brandy and liqueurs are not as well received, the marc has become an enormous problem, literally mounting up by the tons each harvest season. And, a second pressing only further utilizes the existing produce-it does nothing to eliminate the stuff. Nevertheless, the accumulation of debris in mountainous heaps is not an uncommon problem; men have been trying to deal with the waste of their efforts since antiquity. A few years ago while in Greece we visited the remains of an ancient silver mine. Then, as now, Greece, like Israel, was a major producer of silver. In fact, it was with the Athenian’s silver surplus that Themistocles, in 483 BC, had 200 triremes built to evacuate the citizens of Athens and avoid the pursuit of the Persian king Xerxes. (Themistocles had to beg the Athenians to use the money to save their own lives but that is another tale.) The mine was in many ways the same as it had been two and a half millennia ago. The ore hoppers and waterways were still clearly visible as were the chimneys and flues. What was also visible, off to the south end of the site, was an enormous mound of black rock, probably 30 feet in height. The pile was the remnant of the waste rock from the ore production, still waiting for proper disposal after all these years. The first century Roman writer Lucius Columella, in his De Re Rustica, About Country Things, tells us that marc is the perfect feed for those hens that have ceased producing eggs. It was his opinion that the red marc in particular, with its alcohol content, would heal whatever depression had afflicted the hens and that after ingesting the marc they would, having had a little nip, feel up to laying eggs again. Who knows if this would work or did? Might be worth a try if you can locate a chicken psychologist. Whatever the method, adequate marc disposal is becoming increasingly necessary as the demand for Texas wines increases and the acreage needed to produce sufficient numbers of grapes grows along with it. Maybe we should diagnose the melancholic hens of the country and get the omelet pans ready.